Biol Psychiatry. 2014;. pii: S0006-3223(14)00224-8. Ruiz-DeDiego I, Mellstrom B, Vallejo M, Naranjo JR, Moratalla R.
BACKGROUND: Previous studies have implicated the cyclic adenosine monophosphate/protein kinase A pathway as well as FosB and dynorphin-B expression mediated by dopamine D1 receptor stimulation in the development of 3,4-dihydroxyphenyl-L-alanine (L-DOPA)-induced dyskinesia. The magnitude of these molecular changes correlates with the intensity of dyskinesias. The calcium-binding protein downstream regulatory element antagonistic modulator (DREAM) binds to regulatory element sites called DRE in the DNA and represses transcription of target genes such as c-fos, fos-related antigen-2 (fra-2), and prodynorphin. This repression is released by calcium and protein kinase A activation. 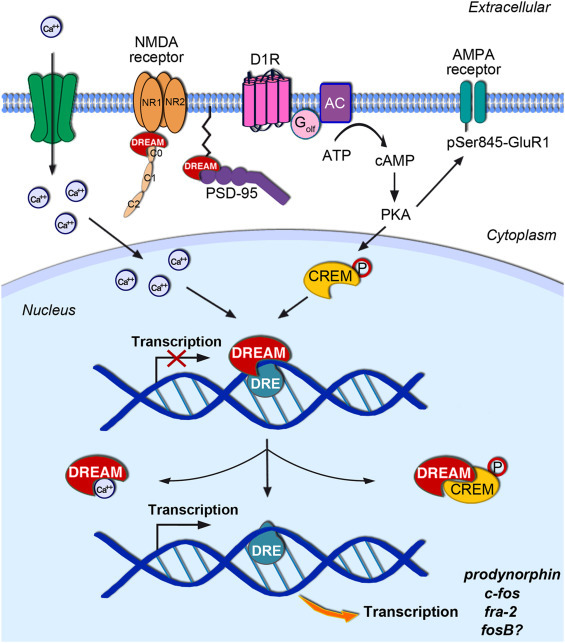 Dominant-active DREAM transgenic mice (daDREAM) and DREAM knockout mice (DREAM-/-) were used to define the involvement of DREAM in dyskinesias. METHODS: Dyskinesias were evaluated twice a week in mice with 6-hydroxydopamine lesions during long-term L-DOPA (25 mg/kg) treatment. The impact of DREAM on L-DOPA efficacy was evaluated using the rotarod and the cylinder test after the establishment of dyskinesia and the molecular changes by immunohistochemistry and Western blot. RESULTS: In daDREAM mice, L-DOPA-induced dyskinesia was decreased throughout the entire treatment. In correlation with these behavioral results, daDREAM mice showed a decrease in FosB, phosphoacetylated histone H3, dynorphin-B, and phosphorylated glutamate receptor subunit, type 1 expression. Conversely, genetic inactivation of DREAM potentiated the intensity of dyskinesia, and DREAM-/- mice exhibited an increase in expression of molecular markers associated with dyskinesias. The DREAM modifications did not affect the kinetic profile or antiparkinsonian efficacy of L-DOPA therapy. CONCLUSIONS: The protein DREAM decreases development of L-DOPA-induced dyskinesia in mice and reduces L-DOPA-induced expression of FosB, phosphoacetylated histone H3, and dynorphin-B in the striatum. These data suggest that therapeutic approaches that activate DREAM may be useful to alleviate L-DOPA-induced dyskinesia without interfering with the therapeutic motor effects of L-DOPA.